This article documents the many modes of transportation found around the various regions of Tamriel. In the late First Era, Empress Hestra improved the roads of her realm, and the Reman Emperors continued her policies. The last period of First Era road-building was in the reign of the last strong Akaviri Potentate, Sidri-Ashak. The Second Empire built an extensive network of roads all across Tamriel (except for Morrowind). During the Interregnum, most of the roads, specially in Valenwood and Black Marsh, became overgrown and abandoned, however, they were reconstructed by the Third Empire. Travel through those roads is the most common way of land transportation. The firsts of those roads were built in Cyrodiil, most of them stemming from the Imperial City, the very heart of Tamriel, and then branching into the neighboring regions. These roads connect all of mainland Tamriel. Many choose to travel by foot, due to poverty, own preference or need. However, most of goods and people travel in carriages, caravans, or mounted on various creatures, varying by region. Foyada Ashur-Dan: from the crater of Red Mountain into the Molag Amur region. Foyada Bani-Dad: starting at Red Mountain, running just north of Maar Gan to the coast north of Khuul. Foyada Esannudan: between Foyada Mamaea and Foyada Ashur-Dan, past the center of Red Mountain. Foyada Ilibaal: from Molag Mar to Mount Kand, forming the rugged Molag Amur region. Foyada Mamaea: from Ghostgate past Balmora all the way to Hla Oad. Foyada Nadanat: through the Molag Amur region. Foyada Zabirbael: northeast from Lake Nabia past Mount Kand to Mount Assarnibibi, in the Molag Amur region. Valley of the Wind: a J-shaped foyada leading to the Cavern of the Incarnate. After the Red Year and the subsequent destruction of Vvardenfell, the existing foyadas lost their importance in traveling across the island. 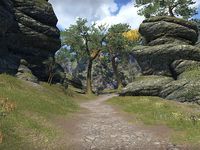 In Cyrodiil, Elsweyr, Hammerfell, High Rock, Morrowind, Skyrim, and the Summerset Isles, roads are relatively safe to travel, and there are carriage and caravan services for traveling between settlements. Carriage travel services are usually located outside of main cities, which usually take the travelers to a neighboring city or town for a small fee. Caravans, however, use to have been used for longer journeys around Tamriel, trading with goods between different regions or carrying wealthier or more important travelers than those who use mounts or travel by foot. 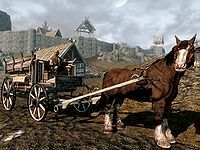 Both carriages and caravans are usually drawn by horses in most of Tamriel; Cyrodiil, the Summerset Isles and Skyrim, and most of Elsweyr, Hammerfell, and High Rock. 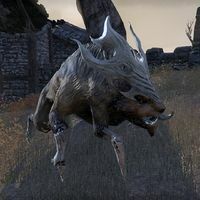 However, in certain regions, the beasts of burden differ from those of Cyrodiil. In the deserts of Hammerfell, the Redguards use camels, in Morrowind, the Dunmer use guars, and in Wrothgar, the mountain Orcs use echateres. 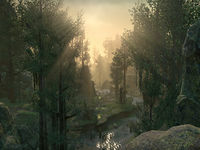 A special case is that of Black Marsh, where the terrain is too harsh for beasts and the carriages and caravans are drawn by native Argonians. 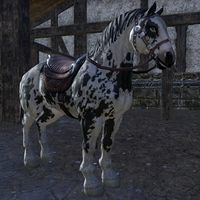 In Cyrodiil, the Summerset Isles and Skyrim; and most of Elsweyr, Hammerfell, and High Rock the most common mount, both for military and civil uses, is the horse. There are many breeds of horse by region, each with certain characteristics which make them more capable for certain tasks: from beasts of burden, to war or travel mounts. In the desert and savannah wastelands of Anequina, senche-lions are the most common mounts. Baandari traders specially favors senche-panthers. On the other hand, in the forests of Tenmar and in the steamy jungles of Pellitine, senche-leopards are the favorite election of locals. However, they are not beasts, they are a certain breed of Khajiit, intelligent, but fearsome. 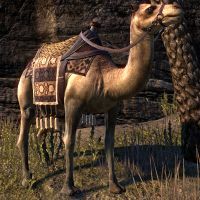 In the desert wastelands of Hammerfell, the most common mount used by the Redguards is the camel. White camels are said to be sacred to Zeht, the Redguard god of food and farming. The devout folk of Hammerfell bow when one rides past. The camels are used as military mounts, as civil mounts and as livestock, from which locals obtain its meat, hide, and milk. 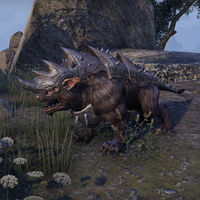 Dunmer and Argonians from Morrowind and Black Marsh use guars as their most common mounts, using them for every task from military to civil ones. 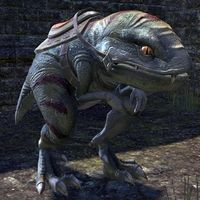 Argonians have a especial link with these creatures and many consider them part of their families. Even in Morrowind, Argonians slaves and freedmen always have been taking care of guars. These reptiles are also used as livestock, from which locals obtain its meat, bones and hide. Occasionally, kagoutis are domesticated and substitute guars due to its larger size and strength, however, they are very uncommon. Vvardenfell House Dunmer used silt striders, huge insectoid beasts similar to fleas, for in-land routes. Travelers could hire the services of a local operator, who directly manipulated the nervous system of the creature, who could travel great distances in a fairly short amount of time. In Vvardenfell, many prefer to travel from one end of the island to the other by city-hopping. After the Red Year, silt striders almost went extinct, leaving only a few in Solstheim and in the mainland, but without their previous importance in travels within Morrowind. Silt Hoppers, a smaller breed of silt strider, used to be used by Ashlanders as a beast of burden. Nix-oxen were first used as war mounts by the Erabenimsun Tribe, extending their use to other Vvardenfell Ashlanders. Iron Orcs, in the Dragontail Mountains, use welwas as their military mounts. Mountain Orcs, in Wrothgar, use echateres as their civil mounts and domesticated bears as their war mounts. Echateres are also used as livestock, from which Orcs obtain its meat, bones, hide, and milk. Wolves have been used as war mounts occasionally by the Imperials of the Colovian Highlands, the Nords of Hjaalmarch, and the Reachmen. Reachmen and Nords of Haafingar have domesticated great elks as war mounts. But their use is and has been very limited. 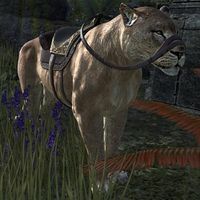 Sabre cats native to Skyrim were also trained by the Nords of Falkreath. However, their numbers are low because they are very difficult to tame. Bears are also a popular mount along the high passes between Bruma and Falkreath. In the desert wastelands of Hammerfell and Anequina, where the roads do not reach, nomadic groups and caravans gathered at oasis' or settlements by local guides, travel across the dunes. In the desert, getting lost is one and the same with dying, especially for outsiders. Senche-lions are the most common mount in the deserts of Anequina. On the other hand, the camel is the only animal capable of surviving in the deserts of Hammerfell, where the Redguards use them as mount and as livestock. In the rainforests and bogs of Black Marsh and Valenwood travel by carriage or caravan is not a good option, even during the times when roads were restored, as the wilds rapidly take away the work done. Roads here are typically overgrown, winding, and beset with hostile men and beasts. Due to this, these two regions have developed their own ways for traveling. By far the most interesting means of transportation in the Black Marsh is by "riding the roots". 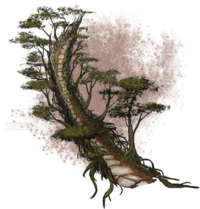 There is an underground expressway of sorts formed within the roots of the Hist trees, and strange parasitic lifeforms will transport passengers over great distances, while they are slowly digested (it takes months to finish the digestion). Guar mounts are also used, especially by locals, due to their capability of riding through marshlands. However, Argonians usually prefer travel by foot or by draft through the almost infinite inner waterways of the region, instead of marching over dry soil and overgrown roads. The thick forests of Valenwood are both the problem and the solution to land transportation in the region. The Green Pact prohibits the Bosmer from harming any vegetal life, but Y'ffre also gave them the power to magically modify their woods. The roads and cities of the Bosmer are shaped from the very trees. Their intertwingled branches make bridges, walls, houses, temples and palaces. 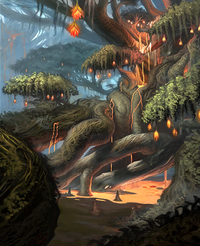 The forest architecture is not only applied to the magnificent graht-oak, which are the centre of their main cities, but to the entire Valenwood. However, sometimes the bridges, stairs and roads made from these branches are too risky to climb and walk for outsiders. Only the native Bosmer and the Imga feel comfortable in the high tops of the trees of Valenwood. Despite of it, falls are common, especially among drunks. Due to the forest architecture and the Green Pact, the locals do not use mounts in their travels, and the Bosmer usually travel by foot (and hand). A certain unique form of traveling in Valenwood was to live in Falinesti, a walking graht-oak which migrated all across the region following a stational pattern. However, the walking city rooted at the end of the Third Era. Another unique example of traveling in Valenwood takes place beneath the region of Greenshade, where there exists extensive underground tunnels which allows travel across the region without being noticed by the local authorities. 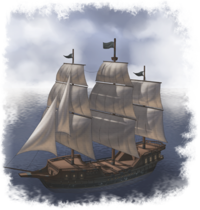 The most common deep water vessel in Tamriel and Pyandonea is the galleon, a big ship with three masts and multiple rectangular sails. Galleons are used both for trade and military purposes. Altmer, Bretons, Imperials, Khajiit, and Maormer all use and have used galleons as their principal warships. Breton and Imperial galleons are especially widespread across Tamriel. The Breton galleon is thought to be the most advanced among its class, and the Imperial galleon has been built since the Second Empire until the present to protect maritime trade routes around Tamriel. Altmer and Maormer galleons are characterized by its bow figures; an eagle and a snake respectively. The Renrijra Maor, a major group of Khajiit pirates and privateers, also use galleons. Swan ships are tall vessels with extensive sails, which can travel across both the sea and the rivers. They are built only in the Summerset Isles, most of them in the wharves of Firsthold. They are also the most favored type for fast travel within the archipielago and between Auridon and the mainland. 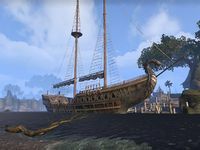 Smaller versions of these ships, with one mast, are common both in the Summerset Isles and its sphere of influence: Valenwood and Elsweyr. 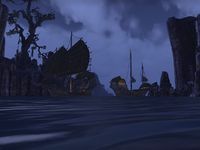 Black Marsh's swampy terrain has forced the Argonians to favor travel through the numerous waterways of the region, only navigable by small-draft ships, which are and have always been the most common and the fastest form of transportation, both of people and goods, inside Argonia. Despite their heavy presence among the crews of big ships, they are rarely constructed by Argonians, as they use other races' ships to sail, commonly those of the Dunmer or the Imperial. 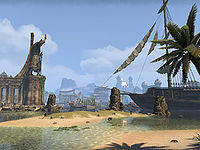 Argonian captains are famous as pirates, privateers and smugglers; and both coastal and inland port cities of Black Marsh have a long tradition of sea sailing. This tradition was shared with the Kothringi, who were among the most valued sailors before they were wiped out by the Knahaten Flu. Bosmer do not build ships as they would require wood they cannot use, following the rules of the Green Pact. 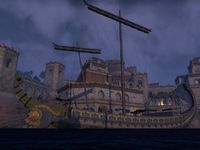 Due to this, most of sea and river transportation in Valenwood is carried out by outsiders, most commonly Altmer and Imperials, varying its presence with the rise and falls of Empires and Dominions. However, Bosmer sailors are common both in Valenwood and outside of the region, working in other races' ships. In High Rock, the heavy influence of the Second and Third Empire in the Breton population have been influenced the design of local ships. Breton cogs, recognizable by having one mast, are also used both in sea and river trade across High Rock and beyond by Breton captains. Big hooded rafts are also used to sail the rivers of the region, transporting people and goods. Dunmer ship architecture differs from the rest of Tamriel, developing a singular style. The Dark Elves build junk ships of many sizes, from three to one masts. Unlike others, their sails include several horizontal members, giving a bug-like appareance to the ships. Prows of Dunmer ships, both civil and war ones, commonly end with a hook-like spur. Dunmer junk ships of three masts are used as military vessels, comparable to other races' galleons. 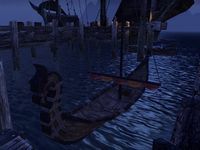 Two and one mast ships, however, are most commonly used in commerce and transportation of people both by sea or by the extensive rivers of mainland Morrowind. Big rafts with bug-like hoods are used to transport people and goods in short distances along the coasts or in the inner waterways. Imperials, especially those from the Gold Coast, have adventured into the seas since the very First Era. Besides the galleon, the caravel fulfil the role of trade vessel, both for inner waterways, like the Niben Basin, and for open sea. 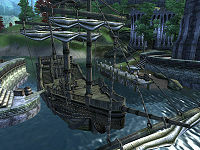 Big rafts are used by the Imperials to sail the rivers of Cyrodiil, transporting people and goods. In the Blackwood, in the vicinity of Black Marsh, drafts are used by locals to travel across the swampy terrain through its small waterways. 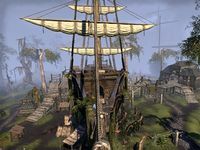 Pellitinian Khajiit, unlike his northern Anequinan cousins, due to its southern location in Elsweyr and traditional plantation economy, have developed a local shipbuilding industry, needed for exportation of saltrice and other exotic products. However, their history is far shorter than that of the other races; the Khajiit did not participate in the All-Flags Navy. 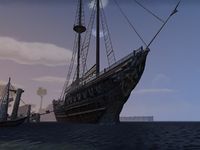 Since the mid-Second Era, the Renrijra Maor, is the principal group who run both piracy, privateering and other seafaring activities based in Elsweyr. These pirates are famous (or infamous) all across Tamriel for their effectiveness. Nords' shipbuilding and sailing history can be traced back to Ysgramor and even before, when groups of men came from Atmora to populate Tamriel. Due to the relative isolation of the province and its unique climate and harsh folks, Nords' longships reflect their needs. The biggest sea ships have two masts and the smaller have one. They are used both for trade and war and during the times Skyrim was independent, Nords' longships razed the coasts of Morrowind and High Rock. Smaller rafts and boats are used to sail the waterways and lakes of Skyrim, however, their importance is smaller than their sea counterpart. Nords lack big ships which can be compared to other races' galleons. Like Nords, Redguards' seafaring history is long and most of Hammerfell ships are unique in Tamriel, as the Yokudan designs were adopted by its descendants. The biggest ships are the Redguard galleys, with both oars and sails, to allow travel with and without wind. These galleys, usually built with three masts, are the Hammerfell's equivalent to the other races' galleons and are used for both trade and war. These ships are also characterized by their iconic bow figures, which represent Yokudan gods, and their painted hulls. Besides the galleys, the Redguards also construct dhows, smaller ships, with one or two masts and triangular sails. These are, by far, the most common vessels in Hammerfell and they are used primarily in transportation of both goods and people. Drafts are built for versatile uses, but their importance is smaller compared to moister regions, where river travel is more widespread. Ashlanders, Orcs, Reachmen and Anequinan Khajiit have little or no tradition of seafaring and shipbuilding due to their landlocked locations and tribal society. They rely heavily on land transportation and the only ships they use are for fishing or very short travel. Archon: is an Argonian settlement and port near the eastern coast of Black Marsh. Lilmoth: known by some as the "Festering Jewel of Black Marsh", is a major city and port located on Oliis Bay. It is the city farthest to the southeast in all of Tamriel. Soulrest: is an Argonian settlement and port located in the southwestern-most corner of Black Marsh. Alten Corimont: is a small port town located in eastern Shadowfen, deep in the province of Black Marsh. It lies on the bank of a waterway, which provides access to the sea. Stormhold: a major city that is used as the Dark Elves' foothold in the province of Black Marsh. It is the capital of Shadowfen, and its part of the northern river, just before Morrowind and Deshaan. Thorn: a city found along the northeast coast, in the region of Thornmarsh. Anvil: is a prosperous harbor city on the Gold Coast by the Abecean Sea at the very southwest end of Cyrodiil. It is the seat of County Anvil and it is located at the end of the Gold Road, west of Skingrad and Kvatch. Leyawiin: is a Cyrodilic city in the extreme southeast of the province, by the mouth of the Niben River where it opens into Topal Bay. The city straddles a swampy estuary of the Niben on the small strip of land between the provinces of Elsweyr and Black Marsh called the Trans-Niben. Bravil: is a squalid town located on the banks of the Niben Bay, south of the Imperial City. The Larsius River passes through and wraps around the town, as the Green Road curves around it. 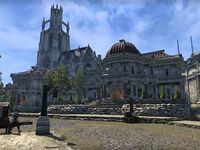 Imperial City: is the capital of Cyrodiil, and a major city and port. The circular settlement is located on City Isle, an island in Lake Rumare in the Nibenay Valley. Senchal: is an infamous city, found on the easternmost tip of Elsweyr's Quin'rawl Peninsula, that serves as the largest port in Tamriel. Alabaster: is a city found inland from the Niben River on the Elsweyr side of the border. It is said that great white walls surround the city, hence the name. The docks of Alabaster were one of the first reported sightings of the Knahaten Flu in Elsweyr. Mistral: is a port city on Khenarthi's Roost. Hegathe: (also called Old Hegathe) is a city in southwestern Hammerfell. It lies along the Abecean coast, south of Sentinel. Sentinel: is a great city of the Redguards, and the capital of the kingdom of Sentinel. It is located in the northwestern hills of Hammerfell, overlooking the Iliac Bay. Port Hunding: is an important city and port in the tropical island off the southern coast of Hammerfell near the Cape of the Blue Divide. Taneth: is a port city in southern Hammerfell on the Abecean Sea lying northwest of Rihad and east of Gilane. 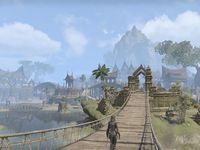 Abah's Landing: is a city and port located beside a natural protected harbor on the east side of the peninsula of Hew's Bane, what started as a simple soldier's camp and shantytown soon grew into a sprawling walled city which dominates the region. Gilane: is a town and port in southern Hammerfell lying west of Taneth and southeast of Sentinel. Lainlyn: is a city in western Hammerfell, in the Alik'r Desert, on the eastern bank of the Iliac Bay. In the middle Second Era, the city was called Tava's Blessing and was later renamed after the Lainlyn family. Daggerfall: is the largest city in Glenumbra, located at the southwestern end of the peninsula. It is the capital of the kingdom of Daggerfall and a major port. Farrun: is a northern port city on the north shore of High Rock, and one of eight kingdoms in the province. It is known for its icy winters. The town began as an Orcish stronghold by the name of Fharun, named after the Fharun Clan. Northpoint: is a major port city of High Rock on its most northern coastline. It was founded in the 9th century of the First Era to capitalize on the location along trade routes in the area, and its fortunes have been tied to coastal commerce ever since. Wayrest: is a major city in the center of the Stormhaven region of High Rock, at the mouth of the Bjoulsae River. It serves as the capital of a kingdom that forms one of High Rock's provinces. Wayrest prospered greatly after the Fall of Orsinium in 1E 980 when the commerce of all of Tamriel began to pass through its gates. Today the city can boast the largest and richest population in High Rock. Aldcroft: is a port town in western High Rock, located on the eastern shores of Glenumbra, in the region of Cambray Hills. Thanks to its location, it has become a key port that services the city of Camlorn from trade routes along the Iliac Bay. Jehanna: is a major city of northeastern High Rock, and one of High Rock's eight kingdoms. It was founded sometime after 2E 582, near the site of the Jehanna Docks in Wrothgar. 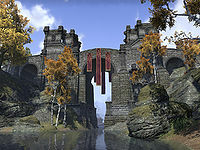 Evermore: is a city on the banks of the Bjoulsae River in eastern High Rock, located near the border with Hammerfell. The city was founded, after the fall of Orsinium opened the Bjoulsae for trade and transport. Blacklight: is a major Redoran city and port on the northwestern coast of mainland Morrowind, close to the border of Skyrim. Across the Inner Sea to the northeast is the island of Solstheim, to the south are the Western Highlands and a good road west connects through the Dunmeth Pass to the Nord city of Windhelm. It became the new capital of Morrowind after the Argonians sacked the former capital, Mournhold. The Council of Great Houses meets there at the Rootspire. House Redoran has substantially improved the city over the Third and Fourth Eras, and its grandeur is said to rival Mournhold at its peak. Necrom: is a city and port on the easternmost tip of Morrowind's mainland which has major religious significance to the Dunmer. The coastline close to the city consists of steep, treacherous cliffs, and sailors are warned to take care in the area. Tear: is a major port city on the southeastern coast of Morrowind. It was once the capital of the Dres District, controlled by House Dres, and was infamous for its slave-pens. Davon's Watch: is a settlement on the mainland of Morrowind, along the southern coastline of the Inner Sea. It was once a major port city in the Stonefalls region, controlled by House Indoril. Ebonheart: also known as the Black City, is a city on the mainland of Morrowind, along the southern coastline of the Inner Sea. Firewatch: a city located on the northernmost tip of the Telvanni Peninsula. Its name comes from the vista of Red Mountain. Raven Rock: is a colony built by the East Empire Company in the Hirstaang Forest, on the southern coast of Solstheim. The colony was founded around an ebony mine. However, currently is a Redoran settlement. 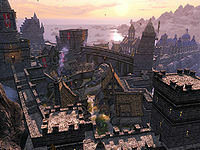 Mournhold: the "city of light and magic", also known as the City of Gems, was the capital city of Morrowind and the largest and oldest city in the province. Mournhold is located in the heart of the Deshaan region of Morrowind's southern mainland, and is the district seat of House Indoril. After the fall of the Tribunal, the settlement and river port is a shadow of its former self. Solitude: is a major port city on the northern coast of the province of Skyrim. It is famous for being the northernmost town in Tamriel. Over time, Solitude became one of the wealthiest cities and counties in Skyrim, and by the end of the Third Era it controlled most of the northern coastline of Skyrim after King Thian married Queen Macalla of Dawnstar. Windhelm: is a city in northeastern Skyrim, close to the border with Morrowind, and is the only substantial city in the Hold of Eastmarch. It is not only the oldest city in Skyrim, but is the oldest continuously inhabited human settlement in Tamriel. Dawnstar: is a settlement on the northern coast of Skyrim, and the hold capital of The Pale. It was originally a garrison town, which often served as an exile post due to the harsh climate. The settlement seemingly got its name due to its reputation for "greeting the sun as it begins its journey". Winterhold (before its Sundering): is the capital of the namesake hold and a coastal fortress on the inhospitable northeastern tip of Skyrim. One of the Old Holds, Winterhold has been historically isolated from its neighbors, yet still wealthy and prosperous; it even maintained a rivalry with the powerful city of Solitude. Winterhold was once the capital of Skyrim. It is home to the College of Winterhold, an institution dedicated to the study of magic, though it is now shunned and feared. Riften: is a city, capital of The Rift, and river port built on the shores of Lake Honrich, nestled in the Fall Forest. Alinor: is the capital of the Summerset Isles and a major city and port in the western shore of Summerset Isle. Dusk: is a port city on the southeastern shore of Summerset Isle. 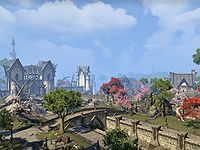 Firsthold: is the oldest, and still one of the most prominent, cities and ports on Auridon, the second largest island of the Summerset Isles. Lillandril: is a port city on the northwestern coast of Summerset Isle. Greenwater Cove: is a town located south of Firsthold. It has an Aldmeri harbor defense system that has been used a long time ago. Shimmerene: is a city located in the middle of the river, between Summerset Isle and Auridon. Shimmerene is known as "the City of Lights." Skywatch: is one of the main cities and port on Auridon, located in its eastern shore. Vulkhel Guard: is a settlement located at the southern tip of the island of Auridon. It was once a major port city. 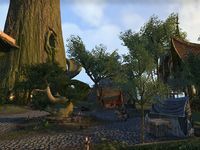 Southpoint: is a coastal city and port in the far southeast of Valenwood, further west than Haven, in the Grahtwood region. Woodhearth: is a coastal city and port in southwestern Valenwood and the capital of the Greenshade region. 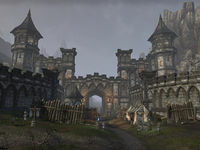 Haven: is a major city and port on the southern coast of Valenwood, in the Grahtwood region, near the Elsweyr border. 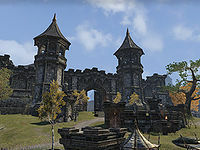 Arenthia: is a city and river port in northeastern Valenwood, situated on the banks of the Strid River, close to the borders of Cyrodiil and Elsweyr. Skilled mages can use portal magic to travel across Tamriel, even bypassing major obstacles, both man-made or natural. However, the performer must know exactly where to generate the portals or he will face catastrophic consequences. This is, the mage must have been there or, at least, see clearly where the portal will spawn. Before its disbandment, the Mages Guild offered instant transportation between their main halls for a small fee. This service was available to members and non-members alike, though members are generally given a significant discount. This practice waned and, most probably, disappeared by the Fourth Era. 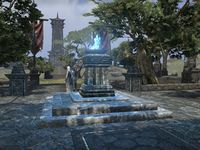 Besides the Mages Guild, both the Tribunal Temple and the Church of the Nine offered teleportation spots in their shrines for those with the skills to use the relevant spells or the money to buy the related scrolls. This kind of teleportation used magic derived from the Tribunal or the Nine Divines, respectively. Like its Mages Guild's equivalent, this practice waned and, most probably, disappeared by the Fourth Era. 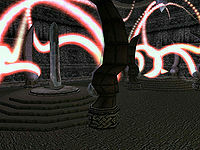 During the Alliance War, the three alliances established individual Transitus Networks in Cyrodiil, a special form of portal magic. This temporary teleportation network allowed troops to instantaneously travel between keeps and outposts, although the networks seemingly had limited range and required constant maintenance by groups of mages when pushing deeper into enemy territory. Transitus Networks are made up of small stone shrines, which glow with a cold blue flame when active. Although similar in appearance, they are unrelated to the ancient wayshrines, which can only be utilized for teleportation by exceptional individuals. 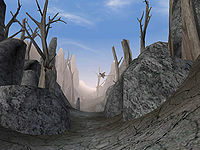 The ancient Dunmer fortresses around Vvardenfell are connected by magical means, such that anyone carrying the correct Propylon Indices can jump instantly from one to the next around the loop. Only one index exists for each fortress, however, and most have been lost over time as the forts have been abandoned by their creators. This page was last modified on 17 January 2019, at 14:57.